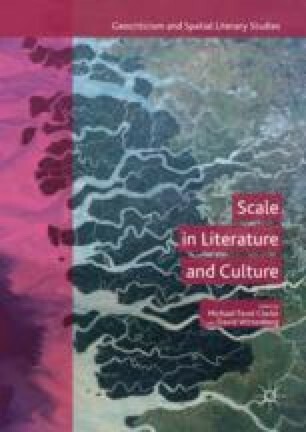 In their introduction to Scale in Literature and Culture, editors Clarke and Wittenberg emphasize the importance of scale for epistemology, scholarly methodology, subjectivity, and politics. They identify historical roots of contemporary preoccupation with scale issues, focusing on the works of Galileo, Kant, and Burke, and the role of scale in the culture of modernity. Exploring the renewed attention to scale, provoked by contemporary discourse on the Anthropocene and globalization, they emphasize the challenges these discourses pose to traditional ideas of agency and democracy. They review recent work on the topic of scale in a variety of disciplines, including literary studies, architecture and urban planning, human geography, film studies, and other fields, and conclude with brief summaries of the collection’s contents. Hamilton, Alexander, John Jay, and James Madison. The Federalist Papers. 1787–1788. Project Gutenberg. Nov. 6, 2009. https://www.gutenberg.org/files/1404/1404-h/1404-h.htm#link2H_4_0085. Murphy, Tom. “Galactic-Scale Energy.” July 12, 2011. https://dothemath.ucsd.edu/2011/07/galactic-scale-energy/. Accessed Dec. 20, 2015. ———. “Can Economic Growth Last?” July 14, 2011. https://dothemath.ucsd.edu/2011/07/can-economic-growth-last/. Accessed Dec. 20, 2015. ———. “Discovering Limits to Growth.” Sep. 7, 2011. https://dothemath.ucsd.edu/2011/09/discovering-limits-to-growth/. Accessed Dec. 20, 2015.